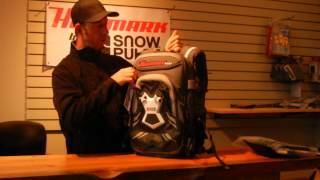 The Highmark by Snowpulse Avalanche Airbag Vest! For those who want the storage of a pack, but the comfort and versatility of a vest, there is nothing better than the new Highmark Vest. Loaded with features, including outside shovel storage, 18L of volume and oversized front pockets, the Highmark Vest is made for the backcountry enthusiast who values freedom of movement on their sled. An additional armor kit is also available for those who want added protection. Please note that this product does not come with an air cylinder. To complete the pack, please add one from the options below.